An early English natuical chart of the Batavia / Jakarta region. 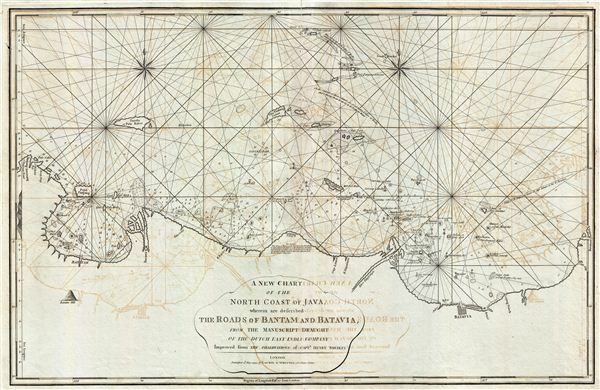 A New Chart of the North Coast of Java, wherein are described The Roads of Bantam and Batavia, from the Manuscript Draught of the Dutch East India Company. This is a fine example of Laurie and Whittle's 1794 nautical chart or maritime map of northwestern Java. The map covers from Bantam Bay (Selat Sunda) and Hill (Serang, Indonesia) eastwards as far as Batavia (Jakarta, Indonesia). This region was a major battleground between rival Dutch, British, and Portugese trading monopolies. The Dutch and British in particular contested over northwestern Java, with its easy access to regional spice, in particular pepper, ports. In 1602 the British East India Company established a trade entrepot at Bantam to contest Dutch East India Company (VOC) control based in nearby Batavia. The Dutch, allied with a local Sultan, eventually drove the English out Bantam and Java itself. By the end of the 18th century, when this map was made, the Bantam entrepot was little more than a name on a map - as seen here - while Batavia further east had risen, with a population of nearly one million, to dominate Java. In 1800, just six years after this map was published, the VOC was formally dissolved and the Dutch East Indies established in its place as a full-fledged national colonial venture. The British meanwhile established themselves in Bencoolen, on Sumatra, and later in Singapore and Malacca. Laurie and Whittle prepared this chart for their 1799 issue of the East-India Pilot. Though most charts in the East-India Pilot were derived from earlier maps prepared for Jean-Baptiste d'Apres de Mannevillette's 1745 Neptune Oriental, this particular chart is a new production unique to Laurie and Whittle. The map offers rich detail including countless depth soundings, notes on the sea floor, commentary on reefs, rhumb lines, shoals, place names and a wealth of other practical information for the mariner. This chart is cartographically derived from earlier manuscript maps prepared by the Dutch East India Company (VOC) and later corrected and improved from an English draft prepared by Captain Henry Smedley. This map was registered by Laurie and Whittle from their offices at 53 Fleet Street, London, on May 12, 1794. Laurie, R., and Whittle, J., The East-India Pilot, or Oriental Navigator, on One Hundred and Eighteen Plates: Containing a Complete Collection of Charts and Plans, &c., &c. for the Navigation not only of the Indian and China Seas, but of those also between England and the Cape of Good-Hope; Improved and Chiefly Composed from the Last Work of M. D'Apres de Mannevillette; with Considerable Additions, from Private Manuscripts of the Dutch, and from Draughts and Actual Surveys Communicated By Officers of the East-India Company A New Edition, Containing One Hundred and Five Charts. (London: Laurie and Whittle) 1797. Very good. Minor wear and verso repair along original centerfold. Original platemark visible. Some offsetting.